Saint Cruz De Apostolado is popular all year and especially during All Saints day in November, and during Christmas and Lent. Part of the Sanctuary Series® candles manufactured by Continental Candle Co. Only Sanctuary Series® candles feature the copyrighted stained glass window design. When burned, Sanctuary Series® simulate the effect of light shining through a stained glass window. An approx. 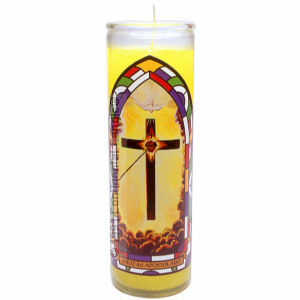 8 inch cylindrical glass candle made using quality wax and a 100% cotton wick.